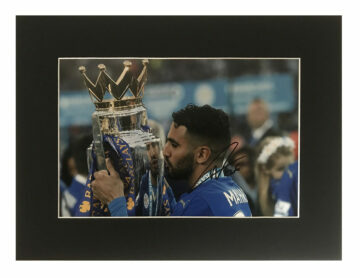 Shop Signed Leicester City FC Memorabilia including player autographs, signed Leicester shirts, boots, photos and other merchandise. All come with a certificate of authenticity, free UK delivery and fast worldwide shipping. Many come with a photo of the actual signing! Premier League giants and four-time FA Cup finalists Leicester Cty FC have an incredible and exciting history dotted with legendary players, breath-taking moments and numerous achievements. Now residents of the King Power Stadium in the heart of Leicester, the club was initially formed in the late 1800s as one of the very first English professional teams. Throughout history they have wowed in the Premier League, proudly standing as one of only six clubs to have won the tournament since its inception. The win itself was remarkable – one of the greatest turnarounds in the history of the sport. In what was described as ‘the greatest sports shock ever’, Leicester went from being relegation favourites to champions thanks to record goal-scoring from star player Jamie Vardy. Startled bookies paid out record amounts to loyal spectators (at 5000-1 odds). The triumph resulted in various nicknames, memes and songs in popular culture – including their temporary title ‘The Unbelievables.’ Some believe that the ‘surprise of the season’ was down to witchcraft or ‘good luck’. Particularly superstitious onlookers claimed that the club’s Thai owners employed Buddhist monks to bless the players – others linked the win to King Richard the Third’s reburial in the city’s cathedral. Leicester itself is perhaps most renowned for one of the club’s and city’s most famous sons – Gary Lineker OBE. Now a celebrated football pundit, he boasts 80 caps for England and 48 goals plus a catalogue of UEFA Cup appearances. In total Leicester have spent all but two seasons in the top two leagues. LCFC fans will love our signed Leicester football memorabilia. Whether you’re a die-hard fan or simply fancy owning a slice of the action, our Leicester collection won’t disappoint. Browse our collections of signed Leicester shirts (autographed by individual players and whole teams) and accessories including autographed Leicester goalkeepers’ gloves, football boots and footballs.